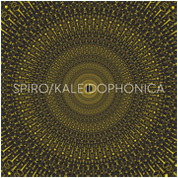 Kaleidophonica is the follow-up to Spiro's much-praised Real World album Lightbox, but it's different, says Jane Harbour, Spiro's violinist and main composer, because "we've taken the most intricate bits of Lightbox and taken the whole mesh to a higher level. And if it sounds as if there are more than four of us playing, it's because much of the time people are playing more than one part at the same time. We try to play two lines on one instrument quite a lot, so at some points there might be eight lines going on..."